today a fellow chowhound and i went to luling city market for lunch to do "research" for the upcoming houston chowhound BBQ smackdown that we will be held later this month. my main objective was to see how much brisket and ribs would make up a pound of each. i needed to know how much we would need to feed the 27 (and counting) attendees for budgeting purposes. what's a bbq smackdown you ask? we will bring 'cue in from more than a handful of bbq joints, the names of which will remain secret. now the fun part! the chowhounds will do blind tastings, fill out scorecards, and even try to guess where the 'cue is from. then while everyone finishes up their lunch, gets in heated debates over central vs. east texas bbq, and partakes in a cold beer or two, the bbq committee will be tallying up everyone's scorecards. the group's 1st, 2nd, and 3rd place winners will be announced including a reveal of which bbq joint each set of 'cue came from. 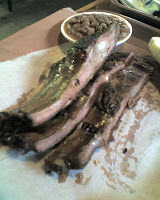 some of the smackdown contenders will be texas monthly top 50 barbeque joints. it will be interesting to see if we pick those same places as our tops too. the smackdown will become an annual houstonCH pre-july 4th event. the plan is next year, we will bring back bbq from the 3 winners from this year and add 3 new bbq joints which will remain a secret and continue on the tradition. back to my lunch, the top left photo is a 1/2 lb of brisket. there are 4 good sized slices plus lots of brisket detritus. we arrived right before 3 pm. by this time, the brisket was already a little dry but it did have a nice smokey flavor. the highlight of the meal were the gorgeous pork ribs. we got 4 large ribs which made up just a tad under a pound. they had a healthy fat to meat ratio and just fell off the bone after one bite. just look at that grease on the butcher paper! ribs are only sold a la carte by weight here. 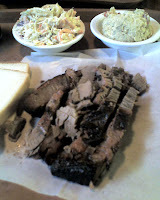 the brisket came as a meat plate with 2 sides. there were 3 sides to choose from and what i had was pretty good. neither the coleslaw nor the potato salad were too sweet which is how i prefer them. my friend certainly liked the coleslaw b/c he finished his and started working on mine too. i didn't try the beans. oh yeah, and way to go tiger! i am told that that was one of the best US opens to date. michael says high drama and ribs go great together. The guys slicing the brisket do a fine job of measuring it out if you ask for something other than an exact quarter/half pound too and they know the difference between top side & bottom side brisket. I don't know if it's still the case, but at one time LCM was related to Houston BBQ Co (Eldridge near Memorial) via father-son ownership, though I forgot which was which. I haven't ventured out that far in a long time, but the recipes USED to be identical. The nice thing about ribs is that their high fat content allows for more smoke saturation. Even the (useless) Southern Pride gas smokers that a lot of commercial places use, can get a decent amount of smoke into ribs. I love the pit at Luling City, it's one of my favorites in the city.